Though it’s widely believed that people who live alone might not do well going home, last year researchers at the Rothman Orthopaedic Institute at Thomas Jefferson University in Philadelphia published research showing that isn’t necessarily the case. At their institution, patients are assigned a nurse navigator who provides assistance before and after hip or knee replacements. Patients who lived alone stayed in the hospital longer and received more home health services than those who lived with others. When they recuperated at home, the Rothman Orthopaedics patients didn’t have higher rates of medical complications, returns to the hospital or emergency room visits than those who went to rehabilitation facilities. Nearly 90% of people who lived alone said they’d again choose a home discharge. Dr. William Hozack, a co-author of the study and professor of orthopedic surgery at Thomas Jefferson University Medical School, acknowledged that patients who go to rehab are probably sicker and more debilitated than those who go home, potentially biasing research results. Still, practices have changed considerably. Today, he and his colleagues send 95% of patients who get hip and knee replacements home to recover. People shouldn’t underestimate how much help they may require at home, especially in the first few weeks after surgery, said Carol Levine, director of the United Hospital Fund’s families and healthcare project, who has had two hip replacements. The potential downsides to going home include a greater burden on caregivers and the possibility that complications won’t be identified as quickly, needs will go unmet if friends and family can’t pitch in, and people won’t follow through on recommended rehabilitation regimens. 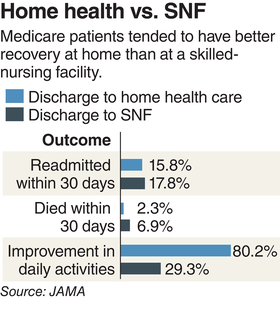 And outcomes may not be as favorable if services that support people at home aren’t readily available. Salt Lake City-based Intermountain Healthcare is bringing an array of services—palliative care, dialysis, primary care and hospital care—into the home through its new Intermountain at Home program. Recovering at home after a hospital procedure is also a focus, and Intermountain has created standardized procedures for hip and knee replacements over the past few years, according to Rajesh Shrestha, the system’s chief operating officer of community-based care. Every joint-replacement patient going home after surgery now gets a thorough assessment to determine the resources needed. A care plan is created and a case manager, usually a registered nurse, makes sure that physical therapy, durable medical equipment and home health care are supplied. The case manager also coordinates postoperative care with orthopedic surgeons and makes sure that patients reconnect post-surgery with their primary care physicians. And a team of providers is available 24/7. During the past few years, discharges to rehab facilities have declined by half at most of Intermountain’s Utah facilities, with no notable increase in complications or hospital readmissions, Shrestha said. During 2018, 85% of knee replacement patients and 88% of hip replacement patients went home after surgery, respectively. Kaiser Permanente has made this possible by introducing new protocols for pain management (opioids are used less frequently), altering anesthesia protocols (less general anesthesia and more regional anesthesia), reducing blood transfusions and hiring “total joint coordinators,” typically nurses, to help with the transition from the hospital to home, among other changes. All patients go home with home health care, receive two outreach calls the week after surgery and get comprehensive handbooks with checklists of what to do before and after surgery and common concerns to look out for. Kaiser Health News is a national health policy news service. It is an editorially independent program of the Henry J. Kaiser Family Foundation, which is not affiliated with Kaiser Permanente.